What’s New in Payments features 12 in-depth articles contributed by payments innovators at Starbucks, Pizza Hut, Barclaycard, Swatch, Frost & Sullivan, CaixaBank, ABN Amro, Nordea and more. This special report includes in-depth technical articles, thought pieces, lessons learned by early adopters, Q&As and more, all contributed by experts with real world experience at the cutting edge of payments. Steve Flanagan, director of marketing at Starbucks Europe, answers questions on Starbucks and the future of mobile payments. This special report has been produced by NFC World and approved by the NFC World editorial team. What’s New in Payments is sponsored by Antelop Solutions, Mahindra Comviva and Proxama. 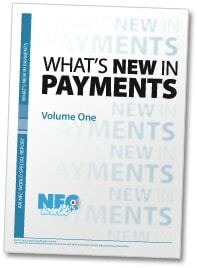 This 104-page document is available free of charge to NFC World Knowledge Centre members (PDF format, 20.3MB).